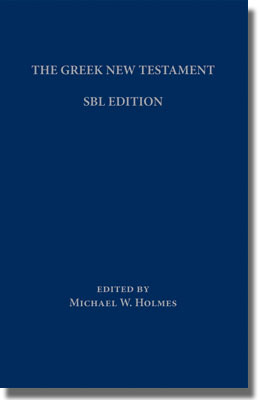 The Greek New Testament: SBL Edition is a new, critically edited and up-to-date edition of the Greek New Testament, edited by yours truly. Jointly published by the Society of Biblical Literature and Logos Bible Software, it’s available both as a free download (with a very liberal end-user license agreement) and in printed form. For more information, visit the SBLGNT web page, where one can read the Introduction and the Preface (camouflaged as the “About” page). As I have time, I hope to post here information about how the text was established and some details and features of the edition, including the accompanying apparatus. –Here is a comparison of the SBL GNT and five other editions: SBL GNT vs 5 editions Web version 2011-06-15. –please see my blog post at the ETC Blog (here). –Here is a link (Holmes 2006 SBL Paper) to a paper I read for one of the sessions of the New Testament Textual Criticism Section at the 2006 SBL Annual Meeting in Washington, D.C. This Web version is an edited and slightly shortened (but not updated) version of the 2006 presentation, published here for the first time. It offers an overview of a key issue in New Testament textual criticism: the synergistic relationship between text-critical theory and method, on the one hand, and one’s view of the history of the transmission of the text, on the other. My own views are deeply influenced by those of Zuntz, who receives significant attention in this paper. If nothing else, page quickly through it and take a look at the three illustrations of different views of the textual history of the New Testament (they are on pages 9, 10, and 14). Thank you, very much Michael. Your work here is a God-send; an answer to prayer. My printed copy will arrive next week… but I have the download version on my systems— the unicode text and corresponding SBL Greek font are very nice. It is great to finally have a freely usable GNT that also ties the “A Reader’s Greek New Testament (NIV)” with the WH, NA, and RP…. very nice. This edition pulls all of us who love Greek into the continued discussion of textual criticism as we consider the word of God together. I suppose the inevitable need to list typos will come. page 42, the header for Matthew 22:8-23 reads “2:8-23″[sic]. Fortunately, it’s not part of the text. By the way, I am especially appreciative of your choice to list differences for both WH and RP [Robinson-Pierpont’s BYZ]. The latter is helpful because the continuity of the Byz tradition is often broken up and less clear in our NA-UBS traditions. Thank you for your work on this, Michael. I am already enjoying my copy from SBL and grateful that there are no foreign language paragraph divisions in the text like the UBS. The font is readable without reading glasses, larger than the pocket NA 27. I prefer your Apostolic Fathers, 3rd edition, for esthetics, though I suppose that one of the co-publishers needed to choose their own font.